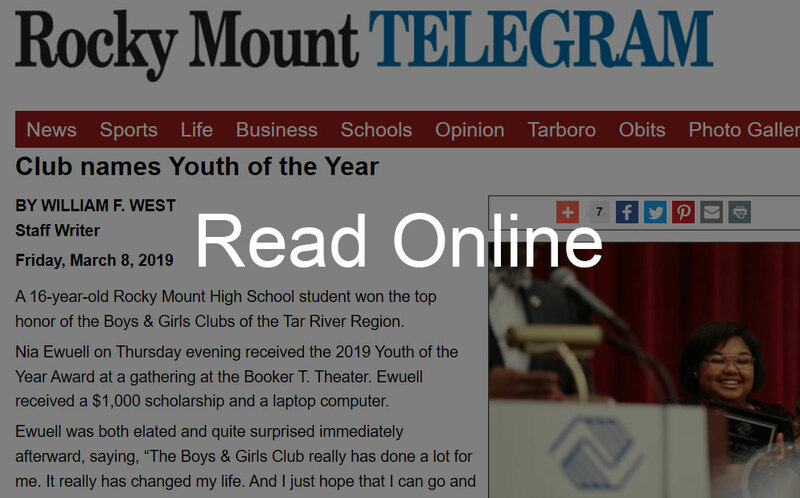 On Friday, March 8, 2018, the Boys & Girls Clubs of the Tar River Region honored 16-year-old Nia Ewuell with the 2019 Youth of the Year Award. Supporters gathered at the Booker T. Theater, where Ewuell was awarded at $1,000 scholarship and a laptop computer. Ewuell was very excited to be chosen and explained how her participation in Boys & Girls Clubs has been a life-changing experience. Now, she hopes to pass it along by making a difference in the lives of other young people and having a positive impact on her community. Copyright © 2019 Boys & Girls Clubs of the Tar River Region | All Rights Reserved. Hosted by UpwardHost.